Compare the suppleness, power and lightness of the black horse with the stiff, worried, painfully tense bay. The ‘body language’ spoken by the shape and movement of a horse’s body tells more than his breed. It shows us the story of his life: past and recent accidents, where and how he lives, even how he’s ridden. Body shape, or ‘conformation,’ is both inherited and acquired. Bone length, thickness and shape are inherited, as well as the type of muscling a horse possesses: long and lean, or short and bulky. 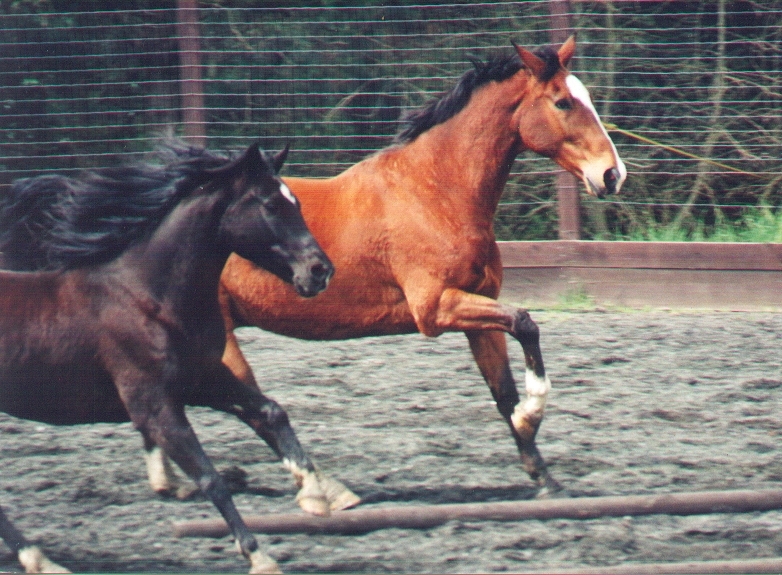 Inherited conformation and character affects the horse’s potential speed, strength, endurance, and agility. As he moves through life, changes happen to that horse’s body, mind and heart. By tuning in to your horse’s current conformation (posture) and movement, you can learn to read the signs of these changes. You might find possible reasons for slow training progress, refusals, ‘bad attitude’ or recurring accidents. You might notice small changes long before they show up as difficult behavior or poor performance. 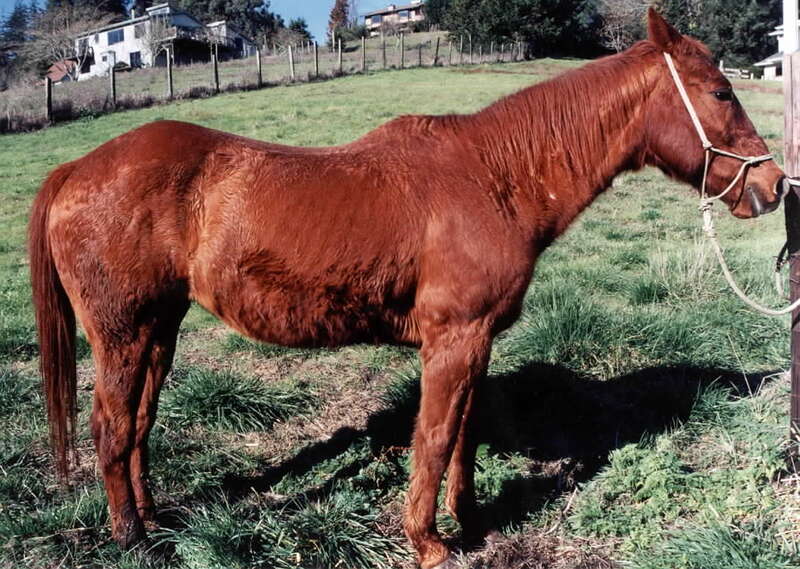 Honey “after” An abused and neglected horse like this 18-year-old mare can make a great recovery with the right help. Much of the poor conformation and stiff, clumsy movement we see in horses is not caused by genetic mistakes or inherited diseases. Instead, it may be due to an untreated injury, chronic pain or fear, excess confinement, unbalanced feet, painful tack, dental imbalance, poor nutrition, an unbalanced rider, or riding techniques that force the horse into overwork or stiff, jarring movement. These horses might be labeled as crooked, lazy, stupid, getting old, accident-prone, or even “a moral reprobate” (as one clinician said of my mare who turned out to need expert dental work). 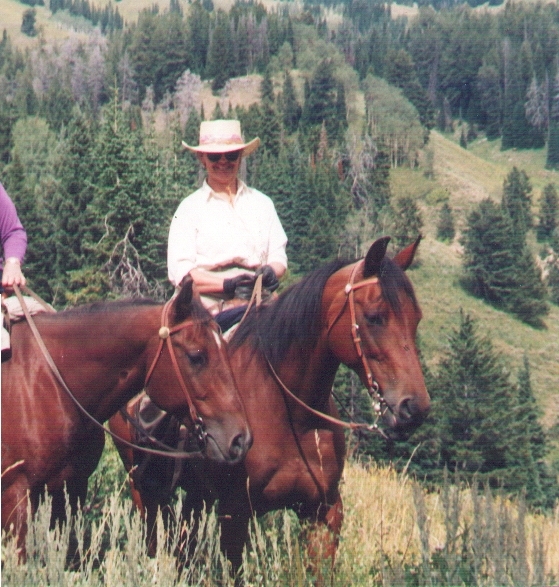 Our horse’s body, like ours, is actually a system of interconnected, interactive components that work together to provide a safe, strong home while giving us the freedom to move and travel. We often focus on the skeleton when we think of shape; but we’d be just a pile of sticks without the powerful but soft tissues like ligaments that connect bones and provide stability and basic shape; fascia that surrounds, supports and connects every body structure; and muscles that provide movement. These tissues are covered up by skin and hair, but we can learn to read how the outside of the body reflects what’s going on inside. Medical evaluations are often made by noting the body’s response to pain; lameness is tested by assessing the movement of the legs at a trot. Our evaluation here doesn’t focus on survival reflexes and mechanical output. Instead, we look at the whole horse for signs of health and well-being – or their absence. It’s best to do this type of evaluation in an area where your horse feels safe and relaxed, and to work in partnership with him. Healthy bodies may have different overall shapes, but they share certain characteristics: curves instead of sharp angles; clear, flowing lines; balanced shapes rather than lumpy, run-together surfaces; and smooth moves instead of stiff or jerky ones. Healthy horses are free to respond and to move in a variety of ways, not trapped in a rigid body or a single way of going or stuck on one note: ‘grumpy’, ‘resistant’ or ‘flighty’. Like people, horses reflect their environment and way of life in how they stand and move. A healthy, rewarding life is mirrored in a relaxed, energetic body and confident outlook. Note: If you suspect that your horse is experiencing pain, consider an evaluation by your veterinarian. As you explore the details below remember that you are observing not just an equine body but a fellow passenger on Earth, a being with a mind, emotions and a spirit who is observing you at the same time. He can give clear signals back to you with gestures, movements, or changes in energy. Add depth and enjoyment to your evaluation by looking for ways in which your horse is communicating with you. You can even ask him to show you where he has a problem, which he may indicate by touching an area with his nose, or turning it toward you. By allowing the horse to (safely) express himself you’ll gain insights about his health and soundness, about your relationship, and about his environment and the other people in his life. 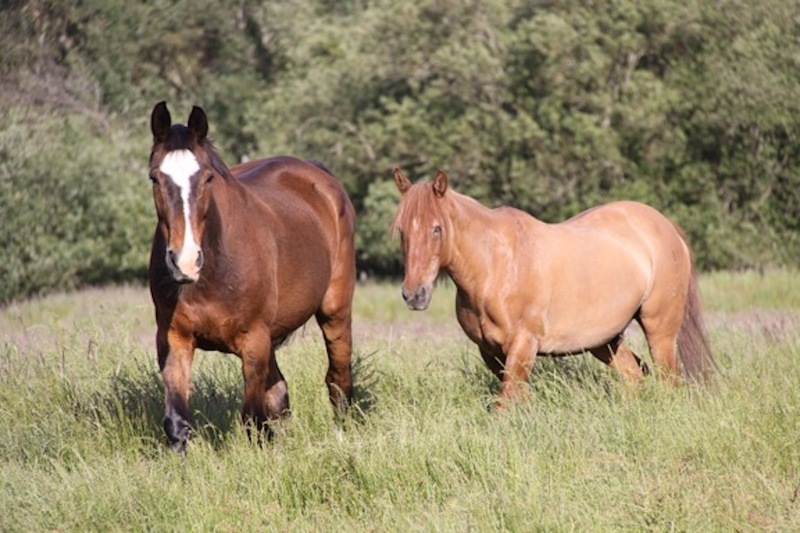 Two 13 year old Quarter Horses. The horse on the right is free to move with pride and grace; the horse on the left has a pained expression, a stiff jaw, and a sagging neck shortened and stiffened by tissue damage. 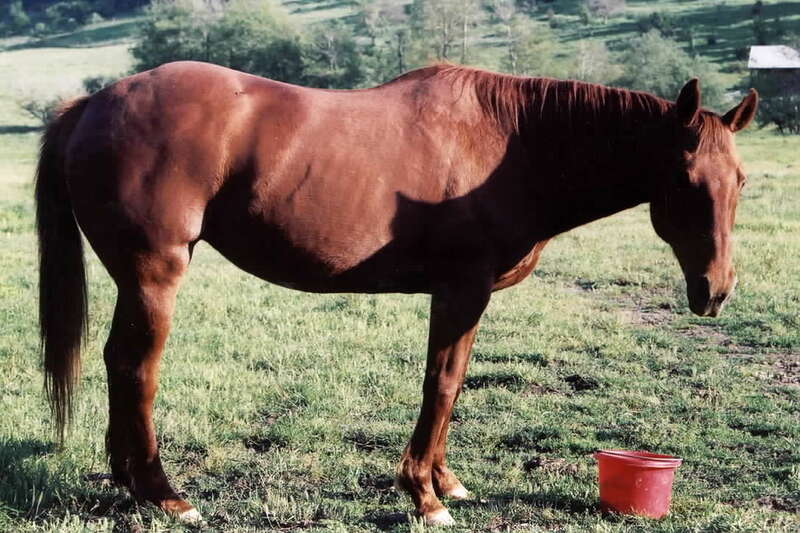 This sample checklist is one way to check on the status of your horse’s body. It contrasts the ideal condition with a less desirable one. Remember, any problems you notice are signs not of a washed-up horse, but of opportunities for healing. Another important tool is to stand back and watch your horse without analyzing or judging. By being present and open, we can gain an overall impression and may even notice something that isn’t on the list. 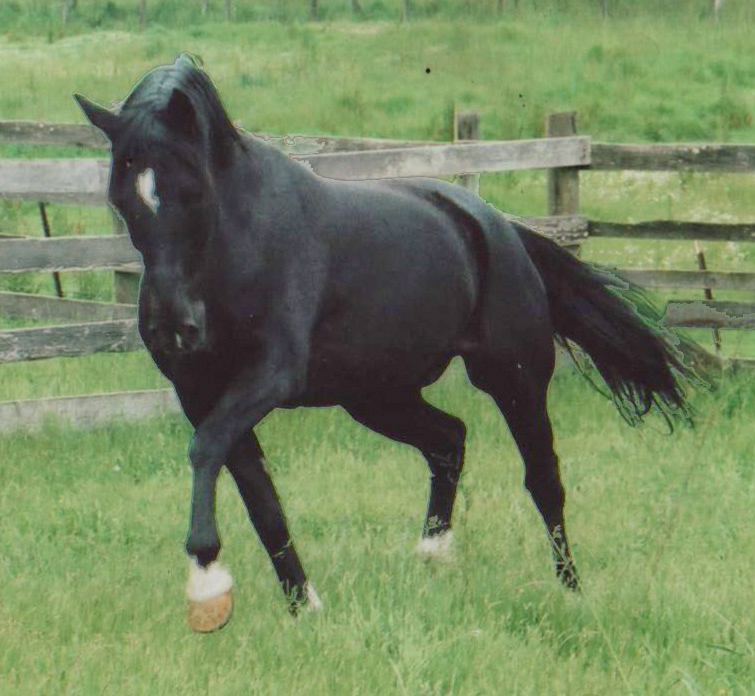 An 18-year-old gelding showing healthy movement: energetic and light, he is looking where he’s going; his body is curved evenly from nose to tail; in the moving legs, joints are flexing; the angles of his diagonal legs match; muscles inside and outside the left hind are balanced. Good posture translates into movement that is free, powerful and straight. A horse with good posture is able to respond more easily to training and to perform well . Posture problems create crookedness and inattention; jolting, uneven gaits; and poor performance such as refusals, slower speeds, and increased injuries. Function, balance and straightness are best seen at the walk. Observe your horse as he walks straight, also in curves or circles, especially at liberty. A horse being ridden or led often reflects what the person is doing, rather than his own abilities. A healthy horse moves with ease and confidence. He can adjust the core of his body to accommodate changes in speed, direction, terrain. He has self-control and awareness of his surroundings. Healthy movement flows through the spine in a wave from back to front. When the horse begins to move, the back and poll flex first, and a hind leg steps off first. ‹ Bella’s Curves	› Healthy or Not?